On 3 October 1990, just 329 days after the Wall fell, the GDR officially becomes part of the Federal Republic of Germany. The country has been reunited and Berlin is once again Berlin. The GDR actually began assuming large parts of West Germany’s economic and legal systems on 1 July 1990. When the Deutsche mark became the sole currency in the GDR, East Germany was as good as part of the Federal Republic. On 23 August, a special meeting of the People’s Chamber (the GDR’s parliament) agreed to the GDR joining West Germany under Article 23 of the Basic Law. Allied control in Berlin has been governing relations between the occupying powers and West Germany since 1949. This control, along with Berlin’s special status, comes to an end in early October 1990, when the GDR becomes part of the Federal Republic of Germany. The Two plus Four treaty is signed on 12 September 1990. It returns full sovereignty to Germany, giving the country sole control over its domestic and foreign affairs. The economic, monetary and social union of West Germany and the GDR comes into force on 1 July 1990. The changes spell the end of the Eastern mark. GDR citizens finally have access to the Western mark, a long-time symbol of West German prosperity. Adults can change up to 4,000 Eastern marks at a rate of 1:1. For pensioners the maximum is 6,000. Savings in excess of those limits will be changed at a rate of 2:1. Wages and pensions are converted 1:1, and debts are halved. Brigitte Wnuck von Lipinski, landlady of Gittis Bierbar in Mitte, talks about the night before GDR money went out of circulation. 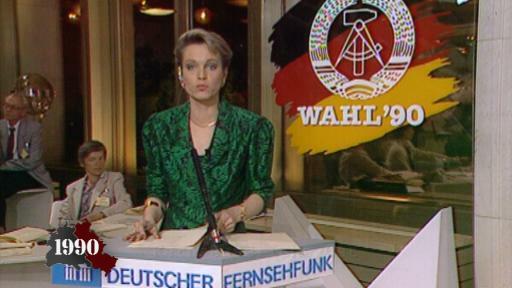 The GDR holds its first free and democratic parliamentary elections on 18 March 1990. Alliance for Germany, which supports Germany being reunified within the scope of the Basic Law, wins the most votes (48 percent). The alliance was a coalition of opposition parties: the CDU (a former bloc party whose leading candidate was Lothar de Maizière), the German Social Union and the Democratic Awakening. The newly founded Social Democratic Party in the GDR (SDP, though it has changed its abbreviation to SPD by the time of the election) wins 21.9 percent of the vote. Lothar de Maizière becomes prime minister of the GDR. 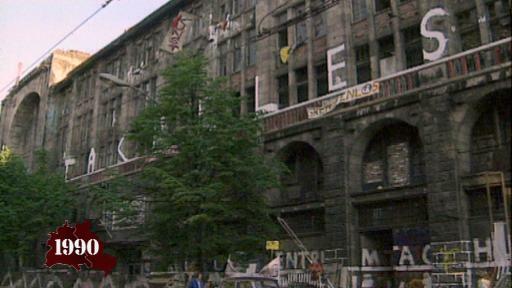 On 13 February 1990 a group of squatters occupy a former department store to save it from being demolished. The building stands on Oranienburger Strasse and dates back to the early 20th century. The new residents rename it Kunsthaus Tacheles and turn it into an art centre that becomes a popular tourist attraction. Members of the alternative scene occupy other buildings throughout the city. A lot of squatters from Kreuzberg move East after reunification. 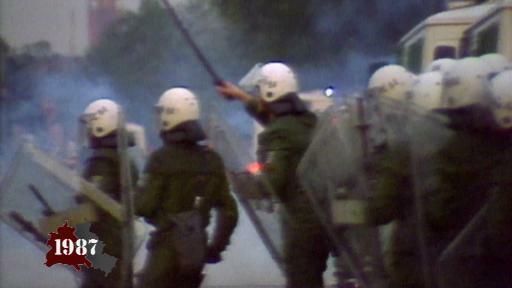 When police clear a number of squats in Mainzer Strasse, riots break out and last for days. The clearance is one of the largest police operations in Berlin’s post-war history. The GDR’s secret service (Stasi) is being dissolved. 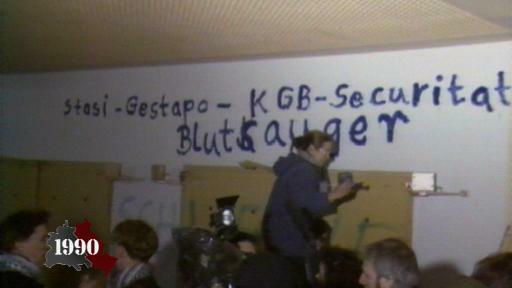 Protestors storm its headquarters in East Berlin. For decades the Stasi spied on its own citizens and hounded political opponents. Its staff included numerous full-time spies as well as so-called “unofficial collaborators”. 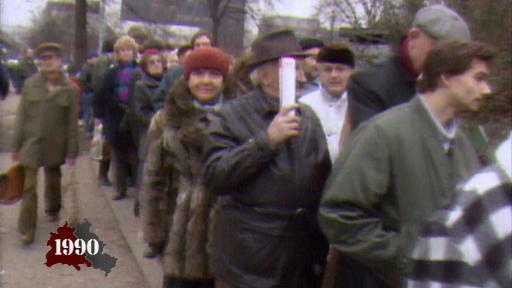 After the Wall fell, the GDR government initially had no plans to dissolve the Stasi. It is largely thanks to the Central Round Table and the citizens’ committees that the Stasi (which by then had been renamed the Office for National Security) was eventually abolished. Carlo Jordan represented the Greens at the Round Table. 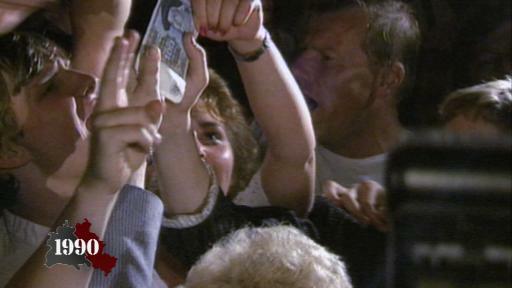 In 1990, West Berliners surprise everyone by queuing up to change their money into Eastern marks. They’re using them to go bargain hunting in East Berlin. The most popular destination is the department store on Alexanderplatz. The Eastern Block is gradually disintegrating. One of the most obvious signs of the change is the roaring trade going on at the Wall. People are chipping away at the concrete and selling the chunks, often with a certificate of authenticity. The Berlin Wall has become one big souvenir. Alwin Nachtweh was one of the entrepreneurs keeping souvenir hunters supplied with pieces of the Wall. He talks about how illegal traders avoided the authorities, and how East Berliners would try to sell him their old uniforms. Some of them, he says, had their whole lives in a plastic bag. By the time 1989 draws to a close, Berlin has changed beyond all recognition. The Wall is no longer the fearful thing it once was. The Brandenburg Gate, once a symbol of the divided city, opens up to pedestrians. 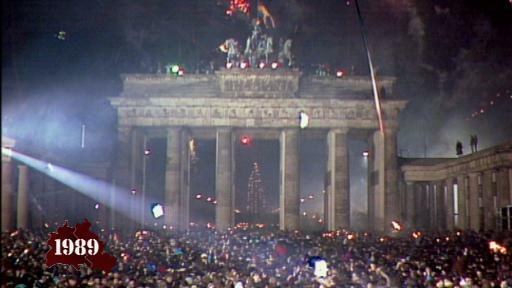 After 28 years of separation, Berliners from both sides of the city see in the New Year together at the Brandenburg Gate. 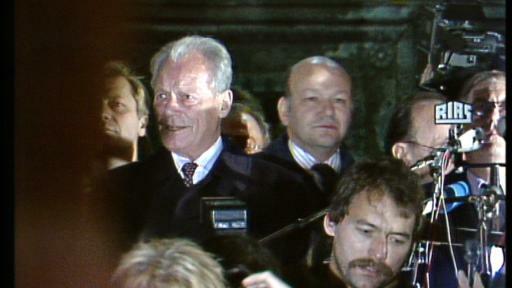 On 10 November 1989, the day after the border opens, Willy Brandt is in West Berlin. The former chancellor served as Mayor of Berlin between 1957 and 1966, which means he was in power during the early years of the Wall. 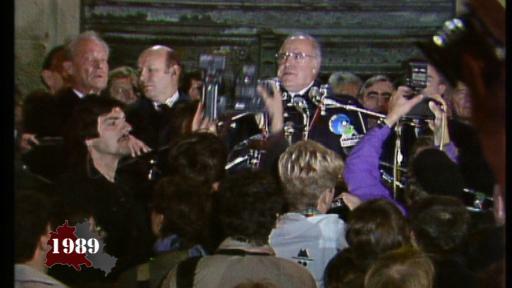 Brandt joins Chancellor Kohl in speaking at a rally outside Schöneberg town hall, where a crowd of Berliners have gathered. In his speech, he says: “From the war, and from the discord between the allied powers, grew the line that eventually divided Europe and Germany. Berlin reproduced this line in numerous ways. But now here we are, and I thank God that it has happened in my lifetime, watching as the two halves of Europe begin finding their way back to each other.” His famous words, “What belongs together can now grow together”, were not actually part of this speech. Also present at Schöneberg town hall are Walter Momper (Mayor of Berlin) and Hans-Dietrich Genscher (West Germany’s foreign minister). 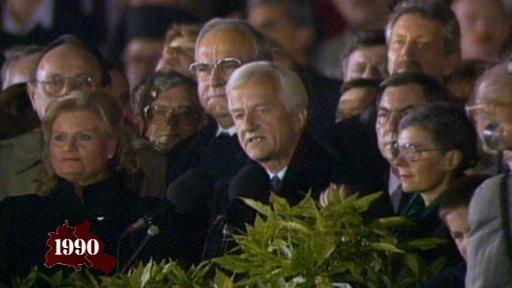 On 10 November 1989, the day after the border opens, Chancellor Kohl gives a speech at a rally in West Berlin in front of Schöneberg town hall. The building was the seat of the Mayor of Berlin from 1949 to 1991. Also present at Schöneberg town hall are Walter Momper (Mayor of Berlin), Hans-Dietrich Genscher (West Germany’s foreign minister) and Willy Brandt (former chancellor). Chancellor Kohl has to try and make himself heard above the noise of the crowd. In his speech, he underlines the importance of German unity, talks about a united Germany in Europe and takes time to remember all those who lost their lives at the Wall. He calls for the country to reject radical ideas and voices, and to remain calm and act wisely in the days and weeks to come. West Berlin 1961: political freedom, modest prosperity. In East Berlin: SED Socialism is working hand-in-hand with the Soviet occupation. Two systems – two currencies – one city. Wolfgang Hermann commuted from East to West every day. Berlin is divided into four sectors: the Americans, Russians, British and French are in charge of the city. The Cold War has become a part of everyday life – for both East and West. "Nobody has any intention of building a wall"
"West Berlin is hosting the first German-American Festival. However, rumours are circulating that East Berlin is planning to close its borders. The Western world watches nervously to see what fate awaits the city. 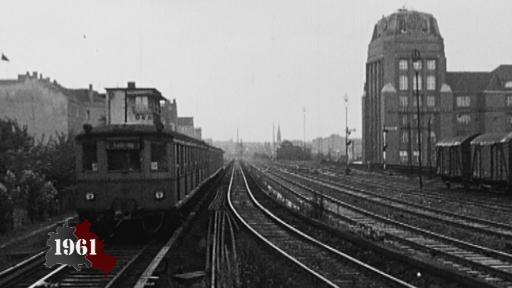 People have been leaving the GDR in their thousands and continue to flee. Cross-border commuters – Berliners who work in the West of the city, but live in the East – are being subjected to ever-tighter controls. 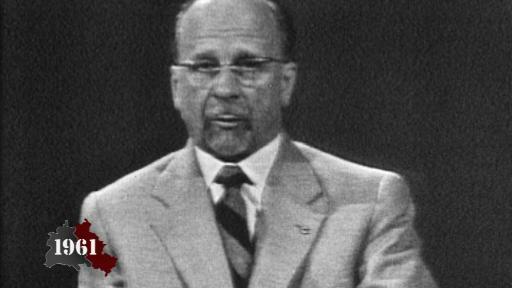 At the same time, GDR head of state Walter Ulbricht faces journalists from all over the world asking about the status of West Berlin at an international press conference. Annemarie Doherr from the Frankfurter Rundschau asks Ulbricht if he believes that creating a free city will involve building a state border at the Brandenburg Gate. Ulbricht gives the following reply: ""I understand your question in this way: that there are people in West Germany who want us to mobilise the construction workers of the GDR capital to build a wall. Am I right? I am not aware of any such plans. Most of the capital's construction workers are busy building flats and their manpower is being put to full use in these projects. Nobody has any intention of building a wall." A few weeks later, events in Berlin reveal his statement to be a lie. On 13 August 1961 the GDR starts building a wall that will divide East and West for the next 28 years. 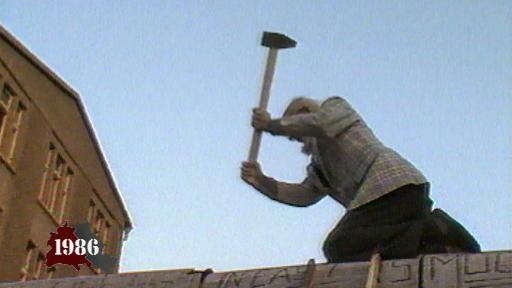 On 13 August 1961 work begins to construct the Wall. The division of East and West shocks Berliners and the Western world. They are left stunned as barbed wire and barricades carve the city in half and tear families apart. The mayor of Berlin is also shaken by events and makes the following statement: "The wall to a concentration camp is now cutting through the heart of Berlin." The number of refugees soared in the week before the Wall went up. In July 1961, 30,415 people applied for emergency accommodation. Over Easter alone, 4,000 people entered the transit camp – the first port of call for those who have no relatives in the West. The powers-that-be in the GDR have decided to put a stop to the mass exodus of its citizens. At first, the Western allies do not react to the closing of the border, as the barricades do not infringe their rights. 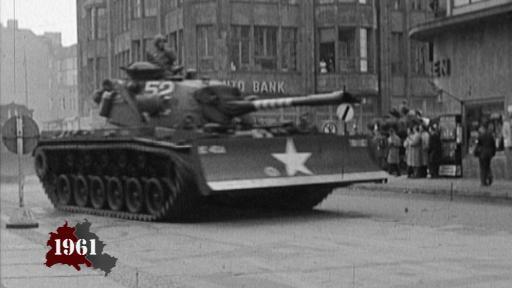 "The world holds its breath: at the end of October, American and Soviet tanks stand face-to-face at the US Checkpoint Charlie on Berlin Friedrichstrasse. 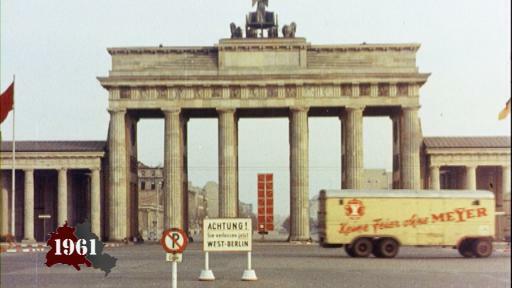 The GDR authorities are trying to restrict the allies' freedom of movement. For several months, the young US president John F. Kennedy has been negotiating with USSR First Secretary Khrushchev, the strongman of the Soviet Union. Khrushchev wants to make Berlin a free city and release it from the joint responsibility of the Second World War's victorious powers, but Kennedy takes a stand. The Berlin Wall goes up and a few months later the situation escalates even further when the GDR tries to impose border controls on foreign diplomats and the military at Checkpoint Charlie. US Special Emissary Lucius D. Clay responds by sending in tanks. Khrushchev then orders Soviet tanks to drive to the border, leading to a stand-off between the two superpowers that lasts 16 hours. " The Eurythmics, Genesis and David Bowie are all on the line-up for a three-day festival outside the Reichstag building in West Berlin. East Berliners gather close to the Wall to try and hear the performances. Protests break out among the crowd, with people chanting things like “the Wall must go”. 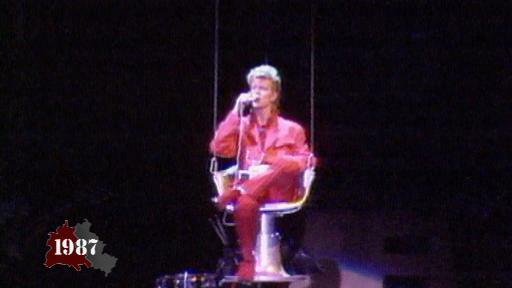 David Bowie talks about his visit to East Berlin. Pink Floyd are performing outside the Reichstag building in West Berlin. Fans also gather on the other side of the Wall, in the hope of hearing some of the concert. 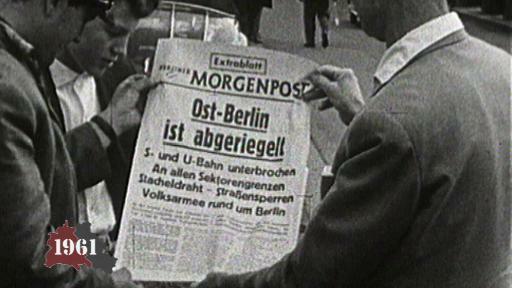 But things take a turn for the worse and the East Berlin authorities make a number of arrests. 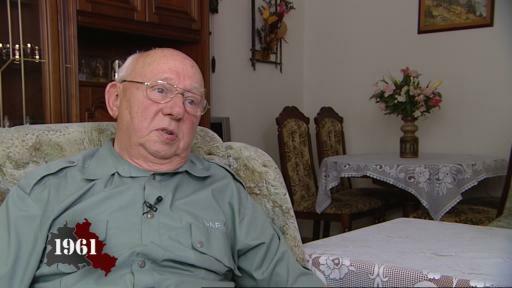 When the Wall goes up, Heinz Kube is 35 years old and works in foreign trade in the GDR. He is in the workers' militia, known as combat groups, and is called up to report to his company on the morning of Sunday, 13 August 1961. The combat groups are given weapons and uniforms and ordered to guard the border. It is a top secret mission and they must not reveal their whereabouts to their families. In 2011, to mark the 50th anniversary of the Wall going up, the rbb interviewed Berliners to find out what the division of the city meant to them. The Wall had a profound impact on the way each person went about their daily lives - no matter what side they found themselves on. Overnight people were cut off from their friends and relatives, from their offices, factories and schools, and from places where they enjoyed spending their leisure time. The division of the city tore families apart, ruptured biographies and claimed many lives. 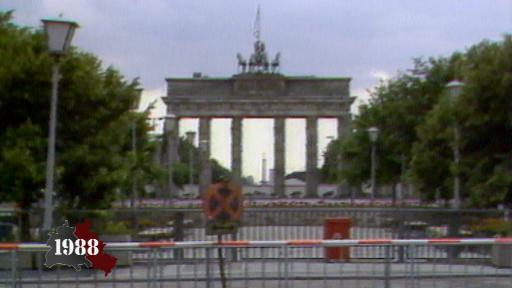 East Berlin celebrates the 25th anniversary of the closing of the border. On the Western side, 68-year-old Canadian John Runnings, whose campaigns earned him the nickname “Wall Walker”, climbs onto the Wall and takes a sledgehammer to it. GDR border guards eventually force him down and the authorities sentence him to 18 months in prison. He is released three months later and leaves Berlin. From 1959 to 1962 Peter Guba - born in 1940 - was a guard in the People's Police and was stationed at the border in Berlin before and after the Wall went up. He used his nine-millimetre camera to capture intimate glimpses of life at the barracks and at numerous border crossings. He has granted the Berlin Wall Memorial at Bernauer Strasse and the German Historical Museum access to his footage. 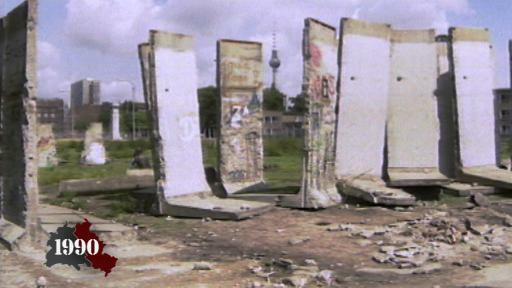 In 2011, to mark the 50th anniversary of the Wall going up, the rbb interviewed Berliners to find out what the division of the city meant to them. The Wall had a profound impact on the way each person went about their daily lives - no matter what side they found themselves on. Overnight people were cut off from their friends and relatives, from their offices, factories and schools, and from places where they enjoyed spending their leisure time. The division of the city tore families apart, ruptured biographies and claimed many lives. On 13 August 1971 Berlin has been divided for ten years. The Wall has become a tourist attraction and popular backdrop for films, with its freshly raked death strip, signal fences, guard dogs, carpets of spikes and watchtowers. Almost 100 people have perished trying to get over to the other side. 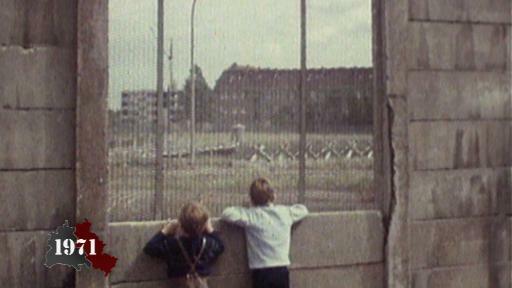 East Germans try to adjust to life with the Wall. 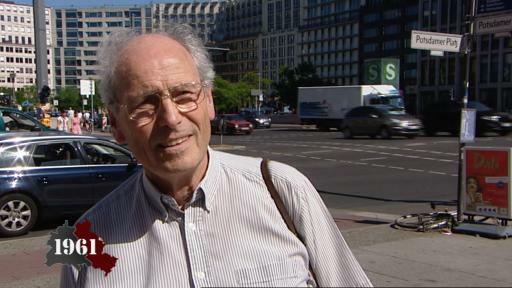 Gert Roth talks about life in the GDR. A huge propaganda campaign is launched to mark the Wall's 10th anniversary and justify its existence.